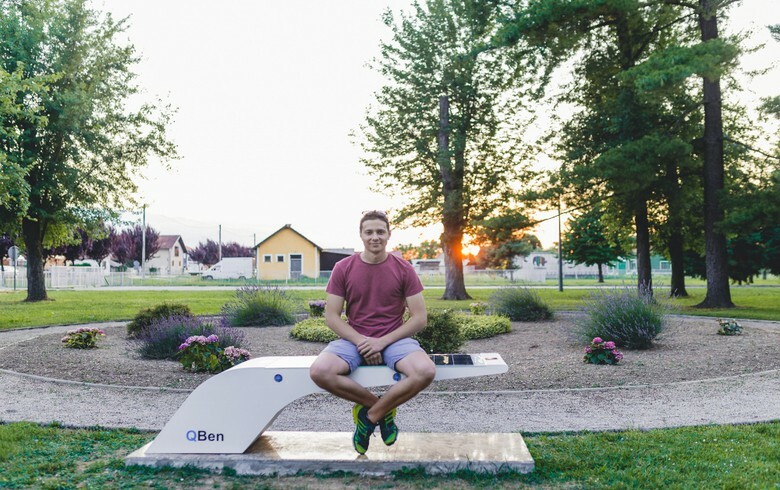 ZAGREB (Croatia), July 24 (SeeNews) - Marko Varga, a 20-year old Croatian entrepreneur whose smart benches have drawn attention from across Europe, told SeeNews he plans to devote the remainder of the year to growing exports and developing new technologically innovative products. Varga developed his first smart bench in his basement around two years ago and is now owner and CEO of QBen, the company which exports its products throughout Europe. "QBen's aim is to make life simpler," Varga said in a recent interview with SeeNews. His smart benches offer wireless and USB charging of mobile phones, tablets, laptops and other electronic devices. Most provide Internet access, while all light up in the evening. Devices can be charged 24/7, thanks to solar energy generated by photovoltaic panels and kept in storage batteries. "Our customers are cities, tourist boards, camps, water parks, hotels," Varga explained. After perfecting the QBen Silver bench, QBen created the QBen Wave bench which uniquely blends innovative design and technology, making it suitable for urban areas. "Our products are very popular throughout Croatia, while great interest also comes from across other European countries. I think this is because we have a very impressive futuristic design that is also very functional," Varga said, adding that QBen's smart benches have been shipped to Austria, Germany and Sweden. However, Varga admitted, he did not always have support from those around him. "Reactions at the start were both positive and negative. The negative ones pushed me to keep doing what I love and what I want". Now the company has also developed a bicycle bench ideal for cycle tourism, and a smart bus station which, as he says, is a "big boom". "We have grown production to a really good level. Of course, we are constantly expanding, but not only in terms of quantity, we will soon also reveal two new directions," Varga announced. "This year, we plant to devote ourselves more concretely to exports, as well as developing new products", he added. QBen currently has some 5 to 7 permanent employees, while subcontractors exceed 30. Varga says investors are always welcome, although admitting he has not had time to source them himself. "I would be prepared to sell a majority stake in the company to a serious investor, because by heading the company I cannot dedicate myself to my big pile of ideas", he explained. In terms of starting a business in Croatia, Varga's advice to young people is to believe in their ideas. "You need to be very brave," he said, adding that Croatia absolutely supports its young entrepreneurs, having introduced in recent times several measures that simplify the process. Small and medium-sized enterprises are the driving force for jobs and growth in Croatia. According to data from the country's statistical office issued in late June, 99.7% of all business entities in Croatia are small and medium-sized enterprises, which hire 72.6% of all employed persons in the country.